There are many different types of resistors available, from surface mount chip resistors to large-sized resistors. WHAT IS A LINEAR RESISTOR? Resistors that obey the law of ohm are called linear resistors, that is, the value of the resistor does not change with the variable current flowing through it. Are those whose resistance value does not vary, therefore, the manufacturer sets a fixed value. Ideally fixed resistors should work independently of changes in temperature, voltage and frequency, this is practically not possible since all resistance materials have a temperature coefficient that leads to temperature dependence. The parasitic capacitance that is present in all resistors will result in the impedance and, therefore, the actual resistance will be different from the expected one. The fixed resistors are available in different sizes, shapes, composition, etc. They are an economical resistor of general use, used in electrical and electronic circuits. Its resistive element is made with a mixture of finely ground carbon powder or graphite (similar to pencil coal) and a non-conductive ceramic powder (clay) to combine them. The ratio of carbon dust and ceramic (conductor to insulator) determines the overall resistive value of the mixture and the higher carbon ratio, the lower the total resistance. 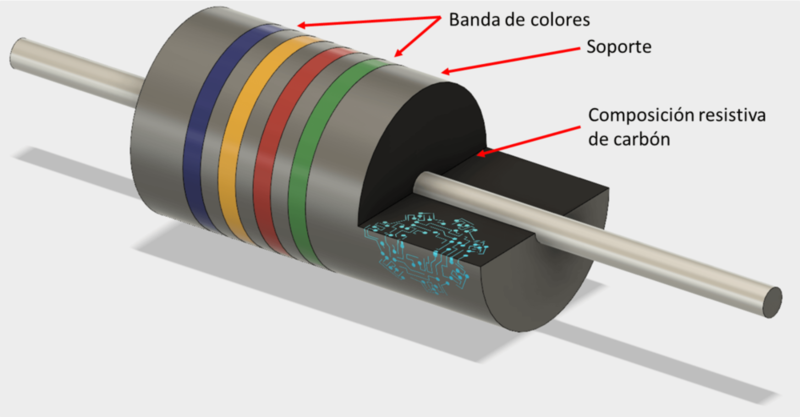 The mixture is molded in a cylindrical shape with metal wires or cables to provide the electrical connection as shown, before being coated with an external insulating material and marking the coding with colors to denote its resistive value. They can be manufactured in a wide range of values from 1Ω up to a high value such as 22MΩ. The advantage of carbon resistors is their ability to remain undamaged form high power pulses, available at a very low cost and good durability. The disadvantages of carbon resistors are high sensitivity to temperature, unstable noise properties and stability problems when hot. They are easily affected by humidity and, therefore, the tolerance is only 5%. They also have a low-medium range power, that is <5W. Composite carbon resistors generally have a “CR” notation (eg, CR10kΩ) and are available in E6 (±20% tolerance), E12 (±10% tolerance) and E24 (±5% tolerance) in packages that support a power of 0.250 or ¼ watt up to 5 watts. The generic term “film resistors” consists of types of resistors of metallic film, carbon film and metal oxide film, which are generally made by depositing pure metals, such as nickel, or an oxide film, such as tin oxide, on a ceramic insulating rod or substrate. The resistor’s value is controlled by increasing the desired thickness of the deposited film, giving them the names of “thick film resistors” or “thin film resistors”. Once deposited, a laser is used to cut a high-precision helical spiral pattern on this film. The cutting of the film has the effect of increasing the conductive or resistive path, such as taking a long length of straight cable and forming it into a coil. 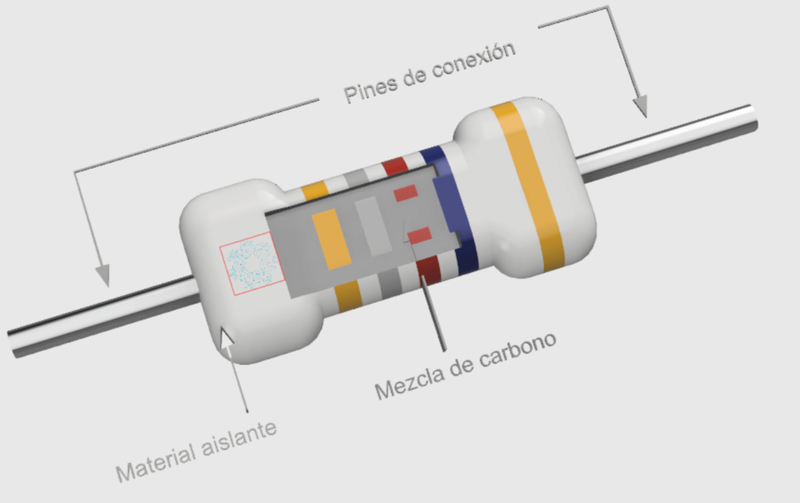 This manufacturing method allows resistors with tolerance values much closer to or less than 1% compared to the simplest types of carbon composition. They are manufactures by depositing a resistive layer on an insulating base such as ceramics. The thickness of the resistive film is equal to or less than 0.1 micrometer. The vacuum arrangement is the technique used to deposit the resistive film on the ceramic. The resistive material that is often a nickel and chromium alloy called nichrome is sprayed on a ceramic insulating base. The thickness of the metallic film can be controlled by modifying the cathodic sputtering time, the patterns are created by a laser cut process in the dense and uniform layer to create and calibrate the resistive value. The thin-film resistors can be produced as SMD resistors or axial resistors. Due to its high tolerance and low temperature coefficient, thin film resistors are used in precision applications. In this type of resistor, the thickness of the resistive film is approximately 1000 times thicker than that of the thin film resistors. The main difference between thick film resistors and thin film resistors is the procedure to apply the resistive film. The heavy-type resistive film is made of a mixture of a binder, support and metal oxide. The union of glass frit is used to join the mixture, the carrier is the extract of organic solvent and iridium or ruthenium oxides are used, this mixture is made in paste form and the resistive film is produced by applying this paste on a base of ceramic using stencil and the process of screen printing. Thick film resistors can be used in applications where lower cost, high power and great stability are important. Metal oxide film resistors have better temperature stability and better surge current capacity. The winding resistors are the most accurate and have the highest rated power. The wire-wound resistor construction involves winding thin metal wire or metal alloy around an insulating substrate. In general, the metals used are manganin or constantan and a chromium-nickel alloy which is also called nichrome is used in the case of the metal alloy. The resistive value can vary by modifying the wrapping pattern, the diameter, the length and the type of alloy. The tolerance of the coil resistors is as low as 0.005% and the power capacities are in the range of 50W-300W, these are precision wound coils. In the case of power resistors, the tolerance is 5% and the nominal power is in the range of kilowatts. They are limited to low frequency applications due to the nature of their construction, because there is a metal wire wound around a coil as an inductor, they act as inductors, this results in reactance and inductance, and when use in CA circuits there is the possibility of overcoming this limitation by winding each half of the cable in different directions, this will cancel the inductive effect of each, therefore, these resistors are called “non-inductive wire resistors”. Normally, the cost of the wound resistors is higher compared to the carbon composition resistors. In high frequency applications, non-inductive wire resistors can be used, although their cost is higher than the normal winding resistors. Wired resistors are used in many applications, some of them are automatic switches. They are those in which the value of the resistance can be varied or adjusted. It is an electromechanical resistance with three terminals and is the most commonly used variable resistance, the two terminals at each end will deliver a constant resistance that results in the total resistance, the center terminal is adjustable, which generates a voltage divider and also this central terminal is known as Wiper. The best application is its use un tuning circuits and radio receivers. It is a variable resistance that is used in occasional adjustment conditions. In general, the presets are mounted on a printed circuit board and adjusted using the rotary control present on top of it with the help of a screwdriver. Unlike the potentiometers where the resistance varies linearly, the resistance in the preset varies exponentially. The symbol of a preset is as shown below. Presets are available in one or more laps operations. Due to its sensitivity, the settings are often used in detection circuits such as temperature or light detection. Most rheostats contain a strip of some substance with fairly high resistance, such as carbon. One of the two contacts of the rheostat is attached to the end of the carbon strip. The other moves along the strips as you adjust the slider or knob. When the sliding contact moves near the fixed contact, the electric current only has to flow through a bit of carbon to get from one contact to the other. This creates only a slight resistance. However, as the contacts get further away, electricity has to travel further along the carbon. This creates a greater resistance, which stops the current. Rheostats are used in applications where current is more important than nominal power, generally used in tuning circuits and power control applications. It is an electronic component with non-linear current voltage characteristics. The resistance in the varistor changes according to the voltage change through it, this makes it a voltage sensitive device, so it is also called “voltage dependent resistance”. The resistance of the varistor is very high under normal operating conditions, but the resistance drops drastically when the voltage increases beyond the nominal value of the varistor. Metal oxide varistors are the most common types of varistors, zinc oxide grains are used because it provides characteristics of PN type diode, therefore, it is used to protect electronic and electrical circuits from overvoltages. They are made of semiconductors with high resistance, their function is produced in the absence of light or in the dark, the value of the light-dependent resistors is very high, generally in the range of megaohms. When light strikes the surface of the light-dependent resistors, its resistance value decreases. It is a resistor whose value varies with temperature. It is a type of transducer; these are used mainly to measure the temperature. As the temperature increases, the resistance of the thermistor decreases for the NTC type and for PTC the resistance increases with the increase in temperature. Resistors can be further divided according to the assembly and rated power. Surface mount devices (SMD) are produced as a result of a technique called surface-mount technology (SMT). The development of surface mount technology is the result of the need for smaller, faster, cheaper and more efficient components from PCB manufacturers. SMD resistors are smaller than their trough-hole counterparts and are generally rectangular in shape, these rectangular chips have very small metal pins or metallized areas at the ends that are used to make contact with the PCB and, therefore, eliminate the need holes in the PCB. The SMD resistor consists of an insulating substrate that is generally ceramic and a layer of metal oxide film that is deposited on this substrate, the resistance value is determined by the thickness of the film. Due to their small size, they are suitable for circuit boards. They have very little inductance and capacitance and can work ell on radio frequencies. The through hole is a mounting technique where the components are inserted into holes that are drilled in a PCB. For this purpose, the electronic component consists of small metallic pins, all the resistors with pins that come out of them for contact purposes come under resistors of trough hole. Through hole resistors are available in carbon composition resistors, carbon films resistors, metal oxide resistors, wound resistors and many others. In addition to discrete components, through hole resistors can be found as a package of resistors with the use of dual on-line packages and unique on-line package techniques. These SIP and DIP resistors are generally used in ladder net with resistance, pull-up and pull-down nets, bus terminators, etc. They are single pack resistors with two or more resistors. Usually, they come in single package on-line or in double pack on-line. These SIP and DIP resistors are generally used in ladder nets, pull-up and pull-down nets, bus terminators, etc. Resistor nets are used to reduce plate space, improve reliability, reduce weld connections and improve tolerance compatibility. In general, resistance nets are used in resistance ladders, bus terminators and small computer system interface terminators. They are available for both surface mount devices and through hole devices.